I was always making little nooks out of areas of our house, barn, yard and forest growing up. And now I get to do so for my kids. It's a perfect place to have a little snack, perhaps you agree? I hope you carve out a little time to have some special moments with those who you love today. That's what Saturdays are for. I shared a couple of weeks ago the beautiful rainbow captured over our homestead. Well, just the other day, we happened to catch a rainbow on the way a beach in our town. And by the time we got to the beach, the rainbow was still there. It was a full arch, but my lens wasn't able to capture the whole thing. It really was beyond marvelous. My little guy noticed the beauty. He wanted me to help him make a rainbow at home. I made a little connect the dots frame for him and he focused so intently. I just love it. And then, a few days later, he came downstairs with a rainbow he created on his own, with no help. Goodness, I love it. It's so easy to see the beauty in a rainbow. But, this child also sees rainbows where they aren't so prominent. He's one who always notices old barns and houses during our travels. He's always concerned if someone's not fixing it up. He worries about old structures falling. He talks about how he's going to help. Usually, we see these dilapidated structures in passing in our car. However, this one, we saw on foot. He noticed it and wanted to walk over to it. There he stood, minutes upon minutes, just inspecting. He spoke of his concern, he wondered why no one was helping it. Mostly, though, he just stood there quietly. Possibly sizing up the situation? Perhaps dreaming of what it used to be? Perhaps dreaming of what it could be? Finally, he shared his solution. "BOG is going to come and help him fix it up so it won't fall to pieces." Nevermind we don't know the owners, this isn't for sale...and there's dozen of other logistic and financial obstacles that make a project as such impossible for us. I didn't say any of that to him. I just put my arm around him and said, "You're totally right. It does need fixing. Just think of what an awesome place it used to be and what it could be." I can't help but agree with him. It pains me to see old structures falling. There's just as much beauty in this old building as there is in a rainbow. Sometimes all it takes is a little imagination to get there. Thankful my little guy is able to see such beauty. Gives such hope for the next generation. And now for Take Two. I cannot believe it has been a whole month since I talked garden with you. You know what I have been doing for the past month? Planting. I have been feeling a little stressed and overwhelmed, to be honest. Big plans were in my head (especially with 46x46 garden #1, 28x28 garden #2, then the annual flowers, perennial flowers, herb spots and fruit spots). Such big plans were a load on my shoulders. It's me and only me who does planting. Well, I do have two helpers who are more 'help' in the garden than I need at times. Plus, with our opposite schedules, I rarely have time kid free. I know, I know, I do it to myself. I don't really 'need' to do it all, but I want to. 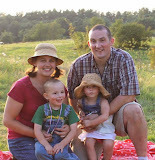 I want to feed my family homegrown and from scratch. I want to get my hands dirty, be tired at the end of the day from hard work, have a full root cellar and all my mason jars full. 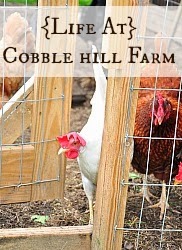 I want a big bountiful garden that will give us delicious fresh meals over the summer. I want to have enough to share. I want fresh colorful bouquets on my table at all times. I want it to be big and beautiful and prolific. Only planting takes an eternity with helpers. I pretty much planted for an hour or two every.single.day. that I wasn't working the month. And today, I'm celebrating because I'm planted. Herbs: Cilantro, Dill, Basil (lots! ), Oregano, Chives, Parsley, Mint, Lemon Mint, Thyme, Rosemary. 5 different kinds of tomatoes (one being cherry)-65 plants planted in all!, peppers, eggplant, 4 different kinds of onions, red and white potatoes, 3 different kinds of beans, swiss chard, collard greens, more random greens, brussel sprouts, 2 different kinds of cukes, zuke, summer squash, spaghetti squash, butternut squash, acorn squash, 2 diff. kinds of corn, sugar pumpkins. Fruits: Five different kinds of apples planted, blueberries, heirloom raspberries, two different kinds of grapes and elderberries, strawberries, peach, pear, plum, cherry. And 7 different rhubarb patches. Is rhubarb a fruit or veggie? Who knows. Annual flowers: Cosmos, glads, morning glory, sunflowers, marigolds, dahlias (traded friend eggs for dahlias....thank you!). Perennial flowers: Too many to list! All veggies were started from seed except I randomly picked up brussel sprouts (forgot about them), parsley (rototilled under by accident) and peppers (seedlings were small). I tried saving seeds from last year and I had success with beans, peas, cilantro, 4 tomato, cherry tomato, 3 squashes, pumpkins. 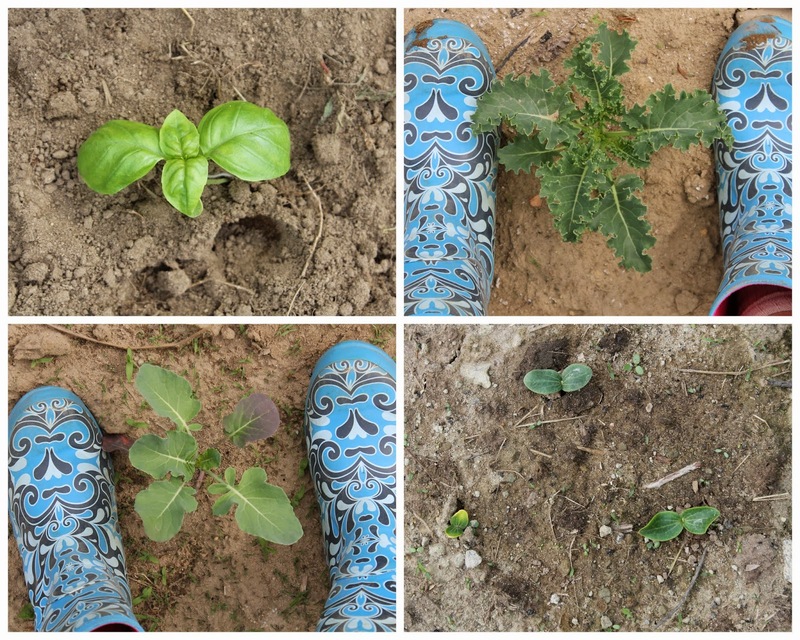 No luck with peppers, broccoli, zucchini, summer squash, eggplant and some flowers. Overall, now that things are in, it's so exciting to see growth! Such great promise. My tomato seedlings are the perfect size for planting. 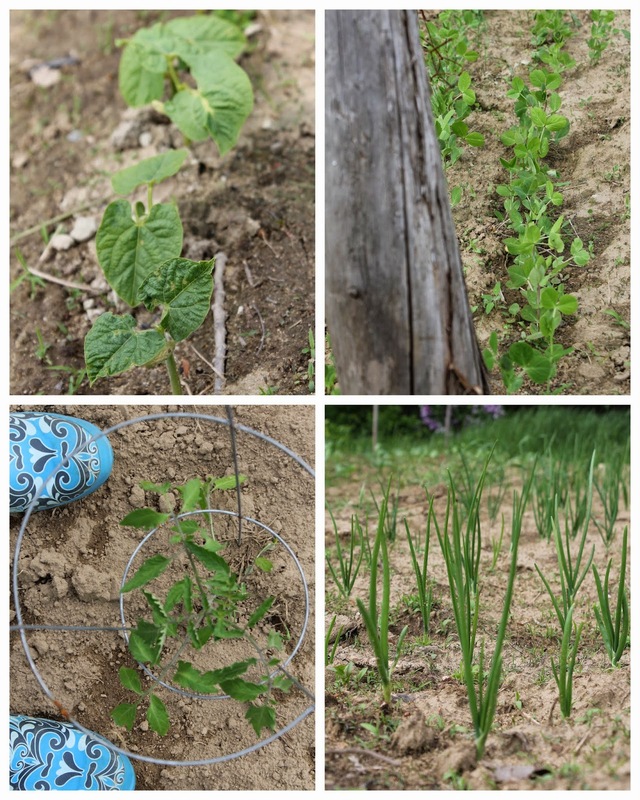 Above: Beans are coming, peas promising, lots of onions and the tomatoes are already so high! Above: Lots of basil, kale, broccoli (I think! ), direct seed pumpkin sprouts. As I go through pictures, I'm surprised that I really didn't take any of my little planters. I think I was so nervous that their little feet would stomp where they didn't belong that I forgot to capture the beautiful moments-particularly when they were planting the corn and beans with me one by one, as they were digging their holes with their little shovels next to me, or when they filled their dump trucks to haul rocks away. Although I was on guard, it really is nice having me interested. Yes, a few seedlings may be lost in the way, but they are learning right along with me, and for that I am thankful. And the view from upstairs in our home, a view they see from both of their bedrooms. A marvelous view, I'd say. Random tidbit: My other new purchase is that fancy scale. I'm hoping to weigh my produce and see how many pounds I produce. A great way to compare year to year. All these dirty boots lined up also makes me happy. And onto the other gardens. This place is over run with secret gardens, which is fab and overwhelming. This particular one looked like this: Arching over our driveway, the whole length of it. I can't even tell you how many hours this was in work. But, do you see the marvelous wall uncovered? !You wouldn't even have known it was there! This is where the concord grapes grow...do you see the size of the vines?! Which they haven't had much space. Hopefully they will do better. Most of the blackberries (planted, not wild) were woody. I totally cut them back and they are improving. Progress here, for sure! Now I'm going to sit and wait. See how it does this year. See what else I will cut back and what I will leave. It's so nice to see the wall though! And now...to this secret garden. Feet and feet and feet and feet of overgrown forsythia. You should see the piles I already have gone through. Do you see the white lilacs? Can't get to them, but want to! That's the goal. At the very end, this is the granite bench I want to get out. But first, I must clear that forsythia. Lots of projects, indeed. But also, we have a plethora of color to enjoy too. Our black chestnut trees are in full bloom. You can hear the bees buzzing under them from afar. Lilac and lily of the valley. Best smells ever. And the "Pig squeak" is so beautiful now. I'm tucking vases of color everywhere around here. After the long Maine winters, a bunch of colorful cheer is just what we needed. Goodness, I've rambled along enough. What is going on in your garden?